We are always keen to answer promptly any type of enquiry you may have. Approximately 15 years ago the trend towards the manufacture of Square Bale Silage began in our region in Western Victoria Australia.Initially there were many failures due to poor sealing techniques.At Scarriff since 2006 this method of fodder conservation has developed "hand in hand"with the research and successful development of The Sinch Square Bale Feeder.Research and Development has been thorough,extensive and ongoing for all types of hay and silage. Ever since silage was invented the number one difficulty has been feeding it out.The Sinch Square Bale Feeder handles square bale silage safely,easily and efficiently. As you will notice on the video silage tends to feed out in a continuous trail as opposed to hay.Modern square balers have the ability to tightly compact silage material at lower moisture content than is possible with pit silage stacks.The feed out equipment/machinery required for pit silage is very expensive with a lot of moving parts.Therefore pit silage because of has much more bulk needs much larger volumes in both manufacture and feed out. Probably the greatest cost advantage of square bale silage is much less volume is required to manufacture Dry Matter Equilavents. It then follows that less has to be stored & fed out. Square Bale Silage is best made between 45% and 55% dry matter.If it is made drier than this there is a greater possibilityof the ensiling process not properly taking place.If made wetter the bales can become unmanageable and difficult to handle.Most times bales are made shorter especially if sausage wrapped & the common length is 180cm - 6 foot. In the square baler the fodder is fine chopped in 15cm-6 inch lengths (helps bale compaction and also helps feeding out). Once baled it can be transported to a solid sand stone pad area or any solid base, stacked 2 high then covered with plastic. A thick layer of sandstone or larger aggregate type material is then placed around the perimeter on top of the plastic edge shown in photos. 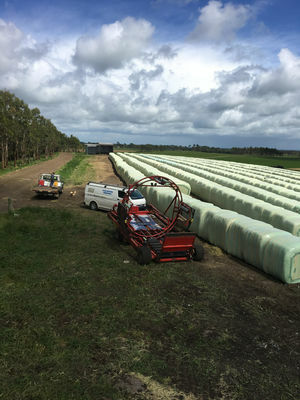 Tyres are then placed on the top in longitudional lines where the bales join.These stacks can be placed on any reasonably flat terrain without any preparation. Stacks can be placed on lush green pasture without any preparation.The main reason for the sandstone pad is to have the option of gaining access in wet climatic conditions.There is no need for plastic under the bales. The stacking of the bales requires a skilled operator to ensure bale are a tight fit to to keep air out. The stacks can be rammed from both sides with loader to achieve straight lines and compaction. The predominant determining cost factor with this type of fodder conservation is moisture content. The higher the moisture content the higher the costs mainly because of the greater volume of fodder material to conserve then feed out. But most times (depending on the weather) to maintain high feed quality the pasture/crop may need to be tedded more than once. Sausage wrapping 2 high is a relatively easier option. This is a fool proof,reliable but more costly option.But this method does have the important advantage of requiring much less labour input in manufacture.